The development of eastern India is a core priority for the present government under leadership of Honorable Prime Minister Shri Narendra Modi. He is convinced that the overall national growth will remain handicapped so long as a major portion of the country like Eastern India remained poor and deprived. Just few weeks back, terming Eastern India as the “nerve centre” of India’s development, the PM emphasized that the entire area of eastern Uttar Pradesh, Bihar, Odisha, West Bengal, Assam and other North-Eastern states must develop fast if India is to develop fast, sustainably and continuously for 25 – 30 years. Another important aspect of poverty and deprivation in Eastern India is that some of the eastern states are house to large chunks of Schedule Caste (SC) and Schedule Tribe (ST) population. The enormity of the task of developing Eastern India can be realized if we just give a glance at some of the socio-economic indicators of the region. In most indicators, states in Eastern India lag much behind the national average. According to poverty estimates for 2011-12 (Tendulkar Committee), Assam, Odisha, Bihar, Jharkhand and Chhattisgarh have as high as 30 to 40 percent of their total population below poverty line as against the national average of 21.9 percent. Further, only 46.6 per cent of households in India have access to drinking water within their premises (2011 census). Eastern States are even below the national average with Odisha 22.4, West Bengal 38.6, Jharkhand – 23.2 and Chhattisgarh 19 percent, while Gujarat 64 percent and Haryana 66.5 fare much better. Not surprisingly, more than 75 percent households in Bihar, Chhattisgarh, Jharkhand and Odisha go for open defecation as they don’t have toilet facilities at all. The national average for Electricity as a source of lighting households is 67.3 per cent while Bihar 16.4, Uttar Pradesh 36.8, Assam 37.1, Odisha 43, Jharkhand 45.8, West Bengal 54.5 lag far behind. LPG penetration as source of fuel for cooking among households in India is 61.6 percent, as on 1st February 2016. In sharp contrast, LPG penetration in Eastern states is below 40 percent. Given the stark reality, it requires herculean effort to bring development of Eastern India to national level. Fortunately, we have a strong and decisive government that realizes the task at hand. Unlike the previous, the present government believes that the poorest of the poor are entitled to the first charge on the nation’s resources. It emphasizes that poverty has no religion or caste. It does not intend to nurture poverty as vote bank unlike some political parties which carefully do so. The prime difference with previous governments is that the vision is backed by clear roadmap, not empty slogans. The plans and programs of the government reflect of such a vision. The thrust on farmers’ welfare, rural economy, financial inclusion, social security, infrastructure development and strengthening of local bodies etc are likely to spur economic activities in rural areas. What is interesting is that the programs designed to tackle poverty dovetails with the government’s focus on Eastern India. Being poor and with muted infrastructure growth, Eastern India is likely to attract more and more funds from the Centre. Honorable Prime Minister is working towards ushering a Second Green Revolution in Eastern India. To make this possible, the Government has taken steps for strengthening higher education in agriculture, setting up 109 new KVKs and three new Agricultural Technology Application Research Institutes. A 24×7 Kisan Channel has been launched to provide information on policy initiatives, prices and other agriculture related subjects for the benefit of farmers. Two new dedicated freight corridors (DFCs) between Kharagpur and Mumbai and Kharagpur and Vijaywada to be completed by 2019 as announced in the Rail Budget 2016, would boost freight traffic, particularly raw material movement for steel, cement and power sectors across the eastern region. A special package of Rs 1.25 lakh crore for Bihar was sanctioned by the Prime Minister in August, 2015 besides an additional amount of Rs 40,000 crores which includes the leftover Rs 8,000 crores from an earlier 2013 package, along with funds allotted for ongoing work of national highways. To showcase the North-east India, 12th South Asian Games was organized from 5-16 February, 2016 at Guwahati and Shillong. The games were the biggest ever sporting event in North East India. On its part, the Ministry of Petroleum and Natural gas (MoPNG) has consciously and constantly focused on efforts towards making hydrocarbons a tool to enable social and economic development. 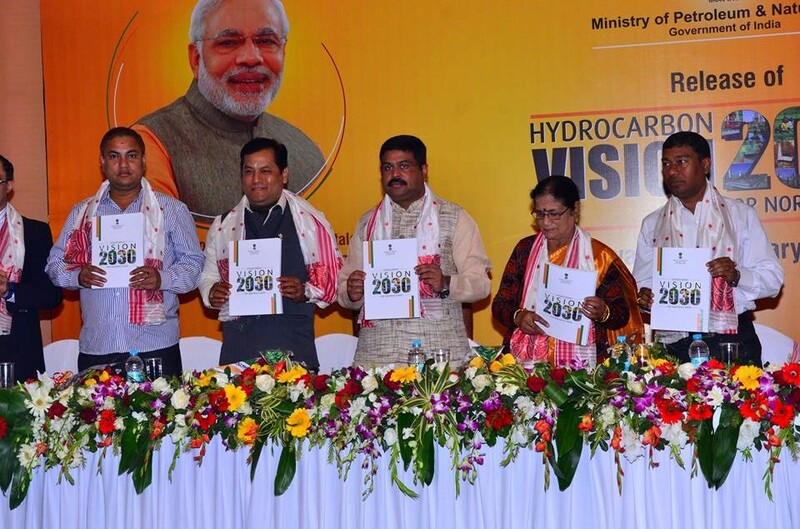 One such initiative has been the Hydrocarbon Vision 2030 for North East Region, which is in fact an action plan to develop the entire North-East region including Arunachal Pradesh, Assam, Manipur, Meghalaya, Mizoram, Nagaland, Sikkim and Tripura. The objectives of the plan are to leverage the region’s hydrocarbon potential, enhance access to clean fuels, improve availability of petroleum products, development of compressed natural gas (CNG) highways and city gas distribution network, and facilitate economic development and to link common people to the economic activities in this sector for enhancing the living standard of the people. Beyond production, the focus areas include exploring hydrocarbon linkages and trade opportunities with Bangladesh, Myanmar, Nepal & Bhutan; implementation of ‘Make In India’ in the region; development of health and medical facilities; industrial policy and infrastructure related action points; focus on skill development; and employment generation requirement in the region. The total investment is expected to be about Rs 1.3 lakh crore by 2030 for implementation of North East Vision 2030. Further, approximately one lakh crore would be invested by MoPNG within next five years to make Odisha the energy hub of eastern India. Country’s largest strategic reserve for storing 3.7 Million Metric Tonne (MMT) crude oil is coming up at Chandikhol, Odisha with an investment of Rs 3800 Crore. The Prime Minister’s UjjwalaYojana to bear initial cost of LPG connection to BPL households will go a long way to empower the poor in the country and especially the Eastern India as LPG penetration is low and number of BPL families is large in the Eastern part of the country. I also hope that with effective implementation of the growth strategy and social security measures envisaged by the present government, the development gap would be bridged soon which would play a crucial role in effectively meeting the Leftwing Extremism challenge faced by many states in Eastern India.